Many of us made New Year’s resolutions last week. Yet in past years, how many of us have actually worked at them for the duration of the entire year? Perhaps that isn’t realistic. But would it be completely unreasonable to set a goal of maintaining our New Year’s resolutions for at least six months? No, we don’t think it’s unreasonable either. In fact, we think it would be all the more rewarding to keep working towards those goals even as the weather turns from frigid to mild. But how exactly does one go about keeping those resolutions on our minds as we return to our busy lives after the holidays? Here are some stellar tips for you that should work if applied properly — no matter if your resolution is to exercise more or cut out a bad habit. This tip is self-explanatory. One of the easiest ways to reach a goal is to work at it alongside a friend who shares the same resolution. This works especially well with fitness goals. It’s easy to give up training for a marathon if nobody is watching you quit running because of the pain. Struggling is always easier with someone else, plus it will be fulfilling after the fact when you both remember how you supported and motivated each other during the tough times. While thinking up your resolutions is the first step, the work hasn’t even begun. How do you ensure you follow through with working towards your goal? If you aren’t going to employ the buddy system, you need another way to hold yourself accountable. Tell your spouse about your resolution, or a close friend. After all, research has shown that people who verbally share their goals and/or post weekly social media updates on their progress as “33 percent more successful in accomplishing them than those who don’t” (CoastalVirginiaMag). If you’re a more private person, try using an anonymous smartphone app to track your progress. For instance if you have set fitness goals, My Fitness Pal allows you to connect with communities of people who share the same goals as you. For some people, all it requires is for them to write something down; if it’s on their to-do list, then it will get done. The problem is that New Year’s resolutions are not typically simple goals you can cross off at the end of the day. Instead of a to-do list, use a daily journal to track your progress. Even if you don’t have the time to write every day, simply recording your progress at the end of each week would be enough. This way you can make notes as to where you’ve improved, and what areas you still need work in. Try to be consistent with your journal recording in the beginning, and you’ll easily get into the habit of it. For others, writing something down doesn’t help get them motivated — but visualizing it (literally) could make all the difference. An article from International Business Times suggests creating a ‘vision board’ in order to achieve your New Year’s resolution. Essentially it is a collage or compilation from photographs and magazines of pictures, quotes, or anything that constitutes where you visualize yourself once you’ve achieved your goals for the year. Get as creative and make it as pretty as you like, since this is something that you should be looking at every day. So put it in a prominent spot, like on your bedroom door! Here are some great examples from Pinterest here. It’s all well and good to set a New Year’s resolution, but it helps get you motivated to know there is a reward at the finish line (and mini rewards along the way). An incentive like a reward could make you work faster and harder towards your goal as well. However if your goal is fitness related, try to avoid rewarding yourself with food as this will counteract your progress. Treat yourself to a vacation getaway instead. During this month of holiday-themed blog posts, we thought this week we’d compile all of the fun, ridiculous, and completely non-traditional holiday decorations floating around the internet. While we avoided some rather lewd ornamentations out there, these are still unusual without being too conventional. Be warned, those of you who take the holidays very seriously — you may not appreciate the alternative style of some of these folks. Enjoy! 6. We can’t decide which is worse! Too many inflatables or too many neon figurines?? 8. Some people like some Christmas cheer in every room of their house! And there you have it! How do you folks decorate for the holidays? After learning about how other people celebrate the holidays, I can honestly say I am glad to be an American. While we drink eggnog, sing along to Christmas carols and our children wait for Santa to bring them presents, in the Ukraine people decorate their trees with spiders instead of tinsel, and in Spain children beat a log until it excretes their presents. 1) Iceland—Yule Lads. Instead of elves, Iceland has their own Santa’s helpers called ‘Yule Lads.’ They resemble Snow White’s seven dwarfs except they’re much, much creepier. And it doesn’t help they have names like Pot-Scraper, Door-Sniffer, Spoon-Licker, and Window-Peeper. Despite the fact that their names are ridden with all sorts of eerie innuendos, the Yule Lads do resemble jolly old St. Nicholas in that they ‘give’ the children of Iceland gifts during the 13 days leading up to Christmas. While this seems harmless, they do have a pet cat cleverly named ‘Yuletide Cat’ who supposedly eats all the children who don’t receive new clothes by Christmas. I really don’t understand this—shouldn’t the cat be eating the spoiled children who are get with lots of gifts, instead of the poor kids who barely have any clothes to wear? 2) Latvia—Demented Winter Festival. Instead of Christmas, Latvians celebrate a Pagan festival called Ziemassvētki from the evening of December 24th to the 25th in which the locals feast on delicacies such as boiled pig’s snout. But not only that, they leave food out for the ‘ghosts’ and I don’t mean on the dinner table. The food can be left in a barn, a sauna, or anywhere for that matter. And it’s left out until New Year’s so that it’s available to the beloved ones who have departed until the beginning of the New Year. My guess is that the rats get to the food first before the spirits do. On top of all this, Norweigan ‘mummers’ (townspeople, so basically anyone and everyone) dress up in ridiculous costumes—typically as bears and horses—and knock on random people’s doors and sing to drive away evil spirits. It sounds a lot like Halloween trick-or-treating in America, except these people are usually adults instead of children and they get alcohol instead of candy. 3) Norway “Hide the Broom”. This tradition also reminds me of our celebration of Halloween. Norwegians celebrate Christmas pretty similarly to us Americans, with church services, feasting, and general merriment. Except they also have a bizarre if not creepy tradition of ‘broom-hiding.’ Norwegians households on Christmas Eve hide their brooms and brushes so that the witches and evil spirits (who supposedly rise from the dead the night before Christmas) don’t steal these ‘necessities’ and wreak havoc until the dawn of Christmas Day. This is really, really strange….I could see hiding your iPad, but is broom really that valuable? 4) Netherlands—Zwart Piet. The Dutch have possibly the most disturbing Christmas tradition of all. Santa Claus, or Sinterklaas as he is called in the Netherlands, does not have elves but one helper called Zwart Piet, which literally means ‘Black Pete.’ I already am uncomfortable with just knowing the name. So Sinterklaas and Zwart Piet arrive by boat every Christmas to give presents to the good children, while the bad children get abducted by Black Pete who takes them back to Spain as punishment. There is some dispute over the obvious racial issue here of Santa having a black ‘helper’ doing all his work for him, but the purists who believe in keeping the tradition say that Pete’s face is obviously black because it’s covered in soot from going down all the chimneys….duh! Yet why does Black Pete have an afro and absurdly large lips? Oh, a better question…why do so many Dutch white people feel the need to dress up as him for Christmas? Maybe people around the world think our Christmas traditions are weird too. What do you think? Are our traditions weird to those outside the country? After the turkey’s gone, will you celebrate Black Friday or Buy Nothing Day? If you were one of the lucky ones who didn’t lose power from Hurricane Sandy, the storm likely kept you home from work (or your kids from school) for a day or two. Not only that, it offset Halloween celebrations, postponing official ‘trick-or-treating’ festivities two days in some towns and up to a week in others. As a result, you or someone you know might have spotted holiday shopping advertisements on television, in circulars or at the mall before you even showed off your Halloween costume. It seems that every year signs of the holiday season are showing up earlier and earlier, whether we want them or not. Upon entering a Yankee Candle store the Monday after Halloween, I was harassed by tinsel, whiffs of cinnamon and employees sporting Santa hats. It was 70 degrees out; when I left my house earlier that day, I almost ran over trick-or-treaters. A little over-zealous this year, aren’t we? If this trend keeps up, our mailboxes are going to be stuffed with Black Friday circulars before Back-to-School ads are even released. Not everyone is enthusiastic about the prospect of busting down Wal-Mart’s doors at 5 am on November 23rd—correction, Wal-Mart isn’t going to wait until Black Friday this year; they’re opening at 8 pm on Thanksgiving Day. 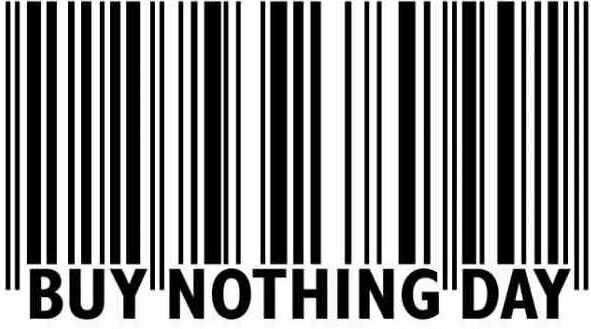 In protest of the issue of over consumption and consumerism during the holiday season, Adbusters is promoting its “Buy Nothing Day” campaign more than ever before. The non-profit Adbusters Media Foundation is a reader-supported magazine “concerned about the erosion of our physical and cultural environments by commercial forces.” The first Buy Nothing Day was held in Mexico back in 1992, and it has since broadened to 65 countries including America where the celebration is held on the day after Thanksgiving—Black Friday, one of the ten busiest shopping days of the year. On Adbuster’s website, the Buy Nothing Day campaign is also referred to as Occupy Xmas, a part of the Occupy Movement. The campaign is requesting shoppers to buy nothing for the 24-hour period that is Friday, November 23rd into Saturday November 24th, which is the International Buy Nothing Day. Adbuster’s website reads: “Go cold turkey from consumer culture completely!” The hope is to spread the message to people to not get caught up with the Black Friday tradition of holiday shopping hysteria, and as a result realize the benefits of a lower-consumption lifestyle and mindset for the Christmas season. It is very likely that many people will ignore this plead to remain home and not shop—for many women, their livelihood is waking up early and landing great bargains on items normally priced more than 50% higher. Not only that, but it seems Adbusters needs to, well, advertise their idea more. Despite the fact the campaign has been a presence in America since 1997, I had never heard of it until browsing on Meetup, the social networking site for local groups. On this site, Buy Nothing Day has been taken to the extreme. A group of activists got together to turn Buy Nothing Day into a “Carnivalesque Rebellion” in efforts to shut down consumer capitalism for an entire week, culminating in Black Friday. You can find your local community who are participating in the campaign and join them in spreading the word, if you so desire. Now that is a much more pragmatic goal, one we should all keep in mind when shopping this holiday season. Dr. Mike Malone is an accredited member of the American Academy of Cosmetic Dentistry and served as it’s formal president. Dr. Malone is the official cosmetic dentist of the Miss Louisiana USA and Miss Louisiana Teen USA pageants and his work has been featured on the Sharon Osbourne show. Enter our Holiday Sweepstakes to win a free 32-inch Sony HDTV.